Ponta de São Lourenço, Madeira, Portugal. English : Ponta de São Lourenço, Madeira, Portugal. English : Scale model of the Earth and the Moon, with a beam of light traveling between them at the speed of light. It takes approximately 1.26 seconds. Banded garden spider (Argiope trifasciata), ventral view. English : Banded garden spider (Argiope trifasciata), ventral view. English : Slow-Motion record of a sparkler. Recorded with 359 fps, played back with 24 fps: slowed down by 15 times. Library building of the Vienna University of Technology. English : Library building of the Vienna University of Technology. English : The ride Kaninlandsbanan at Liseberg from a first person view. English : Common hemp-nettle in Keila. English : European stilt bugs (Metatropis rufescens) in copula. The Maréchal de Lattre de Tassigny Embankment and the Canal of La Peyrade. Sète, Hérault, France. English : The Maréchal de Lattre de Tassigny Embankment and the Canal of La Peyrade. Sète, Hérault, France. English : Ear cleaning has been practiced as a profession by some in Odisha. These untrained professionals mostly roam with a custom cleaning kit containing few tools, cotton and cleaning solutions. This video was shot when a man was getting his ears cleaned in Baramunda bus station, Bhubaneswar, Odisha, India. Letter from Michel de Montaigne to the Marechal de Matignon, 26 January 1585. English : Letter from Michel de Montaigne to the Marechal de Matignon, 26 January 1585. English : Explanation of the Distance Vector Multicast Routing Protocol (in Spanish language). Makedonium monument, dedicated to the Ilinden Uprising, Kruševo, Macedonia. English : Makedonium monument, dedicated to the Ilinden Uprising, Kruševo, Macedonia. Mong Bridge, Ho Chi Minh City, Vietnam. English : Mong Bridge, Ho Chi Minh City, Vietnam. English : A typical courtship interaction between a virgin male (bottom compartment) and a previously mated female (top compartment) Spalangia endius. The male approaches the female and proceeds to wing-fan, after which he mounts the female and performs rapid push-ups of his whole body on the female’s dorsum. The male then retreats following heightened pheromone release, without having mated with the female. Saint Isaac's Cathedral on Saint Isaac's Square in Saint Petersburg. 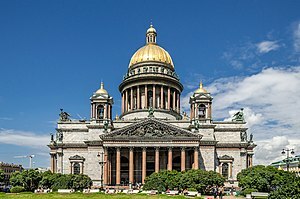 English : Saint Isaac's Cathedral on Saint Isaac's Square in Saint Petersburg. English : Autignac, Hérault, France. Sydney Harbour Bridge from Circular Quay, Sydney, New South Wales, Australia. English : Sydney Harbour Bridge from Circular Quay, Sydney, New South Wales, Australia. English : Tawakkol Karman presenting herself in English. English : Algol (β Persei) is a triple-star system (Algol A, B, and C) in the constellation Perseus, in which the large and bright primary Algol A is regularly eclipsed by the dimmer Algol B every 2.87 days. The eclipsing binary pair is separated by only 0.062 astronomical units (AU) from each other, so close in fact that Algol A is slowly consuming the less massive Algol B by continually stripping off Algol B's outer layers. This animation was assembled from 55 images of the CHARA interferometer in the near-infrared H-band, sorted according to orbital phase. Eristalinus quinquestriatus is a species of hoverfly. Most Eristalinus species have very distinctive eye marking in the form of spots or banding, though these features may fade on some preserved specimens. Most are stout flies, and are nimble flyers, even compared to other hoverfly species. English : Eristalinus quinquestriatus is a species of hoverfly. Most Eristalinus species have very distinctive eye marking in the form of spots or banding, though these features may fade on some preserved specimens. Most are stout flies, and are nimble flyers, even compared to other hoverfly species. Dominosteine noble bitter chocolate coating. Size ca. 25x25x23mm. English : Dominosteine noble bitter chocolate coating. Size ca. 25x25x23mm. English : The President Obama and Prime Minister Arseniy Yatsenyuk of Ukraine speak to the press after a bilateral meeting to discuss finding a peaceful resolution to Russia's ongoing military intervention in Crimea that would respect Ukrainian sovereignty and territorial integrity. 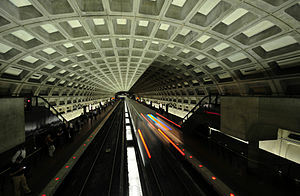 McPherson Square station, Metro, Washington, D.C.
English : McPherson Square station, Metro, Washington, D.C.
English : A train leaves the main station in Cologne in direction to Düsseldorf and crosses the river Rhine. English : Lemons from organic farming. Purekkari neem, northernmost point in mainland Estonia at the end of October. English : Purekkari neem, northernmost point in mainland Estonia at the end of October. English : Dickson Greeting is credited as one of the world's first films. It was filmed on May 20, 1891. The Mayflowers, eel fishing boat (civellier), port of Mortagne-sur-Gironde, Charente-Maritime, France. English : The Mayflowers, eel fishing boat (civellier), port of Mortagne-sur-Gironde, Charente-Maritime, France. English : Nikolai Rimsky-Korsakov's orchestral interlude "Flight of Bumblebee" performed by the US Army Band. Pol-e Dokhtar Bridge, Meyaneh, Iran. English : Pol-e Dokhtar Bridge, Meyaneh, Iran. English : Traffic on "Worringer Platz" in Düsseldorf, Germany. The Brazilian model, actress and television presenter Fernanda Lima with her six medals of nominations to the International Emmy Awards in 2012. English : The Brazilian model, actress and television presenter Fernanda Lima with her six medals of nominations to the International Emmy Awards in 2012. Science library of Upper Lusatia in Görlitz, Germany. English : Science library of Upper Lusatia in Görlitz, Germany. English : Synthesis of MoCl4(OEt2)2. In this episode, the conversion is illustrated of commercially available MoCl5 to MoCl4(OEt2)2 using tin shot as the reducing agent. Island Neuwerk near Hamburg in the german wadden Sea; View from ESE and a high of 4600 feet and distance of 20.000 feet. English : Island Neuwerk near Hamburg in the german wadden Sea; View from ESE and a high of 4600 feet and distance of 20.000 feet. English : Planina Cave, Slovenia. A panorama of the Great Court of the British Museum in London, United Kingdom. English : A panorama of the Great Court of the British Museum in London, United Kingdom. English : A profile of the newest members of the Expedition 39 crew, NASA astronaut Steve Swanson and cosmonauts Alexander Skvortsov and Oleg Artemiev, covering their educational and professional backgrounds and their reasons for pursuing a career in human space exploration. Variability in the shells of land snails of the species Theba geminata. Seven shells of diameter 1.7 – 2.0 cm; collected at the Cactus garden of the Centro de Artesanía Molino de Antigua, Antigua, Fuerteventura, Canary Islands, Spain. English : Variability in the shells of land snails of the species Theba geminata. Seven shells of diameter 1.7 – 2.0 cm; collected at the Cactus garden of the Centro de Artesanía Molino de Antigua, Antigua, Fuerteventura, Canary Islands, Spain. Vao tower house in Estonia. English : Vao tower house in Estonia. English : Mercedes-Benz Museum in Stuttgart, Germany, during blue hour.